That connect from my head to my toes. They protect it wherever it goes! All connected so nothing goes wrong. Bones protect me as I go along! Repeat for left phalanges, pelvic bone, cranium, etc. And the weather gets freezy. Put Dem Bones in a water table filled with corn meal. Provide sifters and let the children sift for bones. 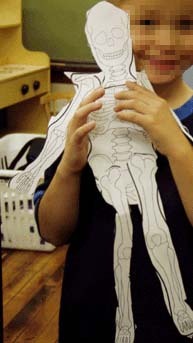 Make a model skeleton by gluing the Dem Bones candy pieces to cardstock to form a skeleton body. Place this model close to the water table so the children can refer to it as they sift for bones. Then they will be able to assemble their bone pieces to look like the model–one skull, one chest, two arms, two legs, two hands, etc. Once they have found all the parts they need, they can go to their tables and glue their skeletons to cardstock. Give each child a surgical rubber glove and have them place it on the hand they do not write with. For younger children, tell them to draw a line from the tip of their finger to the first fold, then from that fold to the second fold and then to the palm, For older children, give them a black marker and have them feel their bones and trace them. They look like their own personal hand x-rays. Find pictures of animals and their skeletons. Copy the skeletons on transparency film. The children can match the skeleton to the correct animal body. You can cut apart the transparencies and place them in order over the animal pictures to make a book. Copy an outline of a person on one side of a paper and a skeleton on the back side of the paper. (They have to be aligned one behind the other.) When you hold it up to the light, you can see the bones inside. If you have one of those tall housekeeping mirrors, you can project a skeleton onto it and trace it with a dry-erase marker. When the kids look into the mirror, they see the approximate location of the bones in their own reflection. Paint small dog bones white and then the children glue them to black paper in the shape of a skeleton. A graph can be found in the Oct/Nov 2003 Kindergarten issue of The Mailbox magazine. Boil a small potato for 25 minutes. Let it cool. To make the skull, peel the skin from the potato and press in 2 cloves for eyes, 2 peppercorns for nostrils and 4 peppercorns for teeth. For the bones, use either baked frozen french fries or potato sticks. This game is similar to Roll-a Snowman. Students roll a die to accumulate skeleton body parts and assemble a skeleton. Announce at the beginning of the morning. There are “20” skeletons hidden in our room right at this moment.. and they are alive. The kids search and search before they realize that it is them.